* 16 games released ! * The contest rules were extremely restrictive. Games are all 8 KB long ! An extended version (including the battle 2 players mode) has been released in 2005 and is available on Kralizec website. 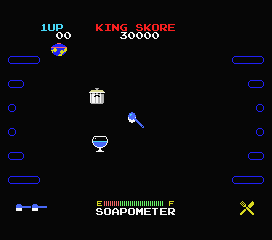 An extended version (including the 1 player mode) has been released in 2005 and is available on Kralizec website. Eduardo Robsy Petrus, Karoshi Corp. (Spain) - donates 50 euros if there are less than 25 valid entries. If there are 25 or more valid entries [Néstor decides], a Panasonic FS-A1 GT Turbo-R japanese computer. Ricardo Bittencourt (Brazil) - donates kit-ricbit, a CD containing all his original software for MSX (including source), plus it has all his development environment, compilers, assembler, and such, and lots, lots of documentation including electronic schematics. Juan Alberto ThulsaDoom Milán Figueredo (Spain) - donates an external RAM mapper of 1024 KB. David Fernández, Imanok (Spain) - donates Cat'n'Mouse original MSX2 game. Antonio Cano-Caballero Pérez makinavaja (Spain) - donates 10 euros. 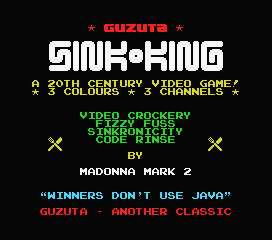 Juan Luis MsxKun, Paxanga Soft (Spain) - donates two copies of MSX HotNumbers original MSX2 game. Manuel Dopico, Moai-Tech (Spain) - donates FM-Sesion music disk and a copy of Moai-Tech fanzine. Manuel Pazos (Spain) - donates Sonyc for MSX2+/Turbo-R.
Armando Pérez Abad (Spain) - donates KPI-Ball for MSX2. Alejandro Corral Granados (Spain) - donates a GunStick light gun for MSX. Hans Otten (Netherlands) - donates MSX-info pages on CD-ROM with lots of useful info. Angel Carmona, Desgalitxat Club (Spain) - donates a MSX Collection Covers DVD and a T-shirt with an MSX image. Calamar Group (Spain) - donates RGB SCART cable for Sony/MSX2+/Turbo-R.
Philip Pera, MSX Games Box (Belgium) - donates a T-shirt with special MSX artwork. The Call MSX Staff (Spain) - donates two copies of Call MSX #2 magazine. Julio Gracia París mesiasmsx, Moai-Tech (Spain) - donates Chaos Angels MSX2 original game by ASCII. Arnau Castellví NapalMSX, Zona Neutra (Spain) - donates 40 euros. Translation : A simple game but fast and addictive. Besides, the technical quality is impeccable. Translation : An eternal classical game, revisited with talent. The version 2 players is especially recommended. Translation : Another entertaining game to which you can easily become hooked if you are not careful. You are very angry when you run out of energy not very far from the exit! Translation : This game seems easy, but taking certain items while avoiding an avalanche of stones is complicated. Very entertaining. Translation : Another classical game correctly converted and that will provide entertainment for some time. Who has put that wall there? ?Los enemigos que no matas restan energía? Interesante mezcla de matamarcianos y Arkanoid. Translation : The enemies don't kill the remaining energy? Interesting mix of shooters and Arkanoid. Aquí tenemos algo muy original con sabor a juego de cinta de los primeros 80. Sólo le faltan opciones como &#8220;Iniciar revival&#8221; o &#8220;Organizar Ru&#8221;. Translation : Here we have something original with the spirit of agame on tape at the beginning of the eighties . Only some choices like &#8220;Start Revival&#8221; or &#8220;Organize Fair&#8221; are missing. Translation : Perfect for rescuing the gun collecting dust in the cupboard. Funny, but alas it becomes a little repetitive. Translation : Ideal game for mathematical minds. The rest of humanity will only be interested a little, but the idea is good. Translation : Very curious, it looks like the games that came with the magazines a couple of decades ago. Good for fans of chance games. Go for the PUNKTE! Translation : The best thing about this game is the idea and the graphics, it is a pretty nice game. Alas, there is only one screen, it's boring after a little time. Hum... un juego un poco... raro. Apropiado para nostálgicos del Decathlon y otros machaca-teclados, aunque se pasa un poco de simple. Translation : Hum... a game a little... rare. Suitable for nostalgics of Decathlon and other mechanical keyboards, but it is a little simple. Translation : A even more rare game , although the idea is to imitate an original LCD. We need to pick up the monitor with both hands and press the screen buttons with the fingers.